Canadian-American Structured Solutions Inc., headquartered in Billings, has laid off about half the employees it hired when the company opened its doors in May. 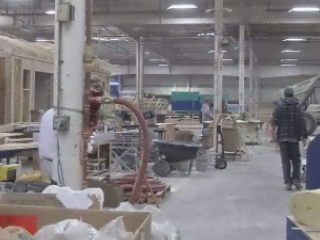 The Colorado company hired 75 workers last spring when it chose Billings as its headquarters in a warehouse at 1400 S. 24th St. W., to build modular homes to help address the housing shortage in 10 Western states and three Canadian provinces. CASS Homes' president and chief executive, Lorne Wallace, of Toronto, said Saturday afternoon that while less than a handful of employees have been terminated, the layoff of about 30 workers is only temporary. Wallace said the company is completing a seven-unit townhome project in Baker next week. In the meantime, CASS Homes is preparing for a 12-unit project in Glendive and a 90 home subdivision in Saskatchewan, Can., in February. Once the materials arrive, the pieces of the project are prepared in Billings, shipped to the project site and then assembled, he said. Wallace said with the upcoming projects, the privately owned company intends to hire up to an additional 25 workers in addition to bringing back employees from the temporary furlough.